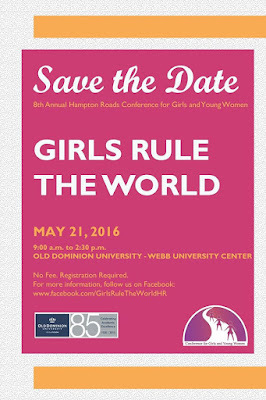 Old Dominion University will host the 8th Annual Hampton Roads Conference for Girls and Young Women "Girls Rule the World," on Saturday, May 21, 2016 in Webb University Center. The daylong conference provides workshops and presentations that are intended to inform and empower girls and young women to become productive citizens and leaders. Last year's conference was attended by almost 400 girls, young women, parents and other interested adults. It was a rousing success and we expect this year's conference to bring an even larger audience! The conference is free and open to all young women ages 10 - 18 and accompanying adults from the Hampton Roads region and beyond. Learn more here. Join us at the spring Town Hall meetings for your chance to share ideas among volunteer and staff teams. All volunteers are invited to attend the Town Hall meeting that is the most convenient. RSVP here at least 24 hours in advance to indicate the meeting you plan to attend. We value your input to help create the agenda. While supplies last. In-stock items only. Receive a 15 percent discount off entire purchase when you show your active duty or retired military ID card. Through travel, girls gain enormous benefits. They develop self-confidence and learn leadership skills by planning, earning money, and venturing out. Thanks to you, girls can experience unforgettable, life-changing adventures. This chart provides at a glance information for the trip approval process. Detailed information is available in Volunteer Essentials, pages 110-115. MEETING TIME, DAY, AND SINGLE OVERNIGHT TRIPS WITHIN THE COUNCIL BOUNDARIES with activities that are not high adventure/ high risk. Approved by the TROOP LEADER. MEETING TIME, DAY, AND SINGLE OVERNIGHT TRIPS that have activities that are high adventure/high risk*. Submit the Trip Approval Form to the SERVICE UNIT PROGRAM CONSULTANT or designee at least two weeks prior to the trip. 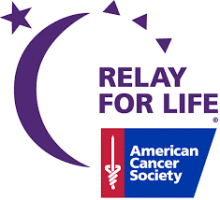 Relay for Life (Chesapeake) Activities and Entertainment is looking for assistance. If you or your troop have some time to spare, please consider volunteering. It will be a fun day for a great cause. You take AWESOME to a whole new level! Your big bright smile, your fierce dedication, your no-limits kindness—every little bit of it makes such a huge difference to the girls you help shape, inspire, and fill with confidence every day as a Girl Scout volunteer. Thank you, thank you, thank you! In case you didn’t already know it, you truly take AWESOME to a whole new level, and we’re so grateful for you. GSCCC’s Peninsula office and shop will be closed on Tuesday, April 19, 2016. Sign Her Up for Another Year of Fun! It’s time to get ready for another wonderful Girl Scout year with renewal. Help keep the party going for those girls who count on us so much. Troops and individual members can take action today and renew their membership. And because we appreciate you, the Council is offering girls, troops and service units some great renewal rewards! All girls receive a free Early Bird Renewal patch when renewed by June 6! Check out this incentive flier for full incentive details. Troops, be sure to take time to complete the Opportunity Catalog when you renew. This event encourages middle and high school students to serve their community as a pathway for academic and personal success. The program includes a hands-on service project, discussion groups and a volunteer fair for teens. Earn 3 hours of community service credit by registering for Global Youth Volunteer Day here! RSVP by email to marinemara@yahoo.com with "Car Workshop" in subject line. You will then receive further registration and payment instructions via email. Join us as we get inspired to paint a portrait or a still life on canvas. We'll teach you how! $12 (covers clay, instruction, glazing and firing of pieces and a bonus kiln room tour). Girl Scout Juniors will hand build a clay flowerpot and garden marker to get ready for spring! Is there an individual or community organization that you would like to recognize with a Community Award certificate? You can now request certificates at any time of the year. Fill out this online form, and you will receive a certificate signed by the CEO within four weeks of request. Access the online Community Award request form here. For questions, contact Cheryl McGrenra, Adult Learning Manager, at cherylm@gsccc.org. You’ll have the opportunity to visit our community partners and find out what new and exciting programs they can offer your girls, pop in a workshop session where you will take home some nice-to-know information, or chat with someone you haven’t seen in a while. Come for the entire time or come for a few hours - you can decide your schedule. This two-part course is designed for adults with camping experience to learn advanced cooking methods, and program and outdoor skills. Emphasis is on advanced lashing, compass skills and nature exploration. Attendance at the pre-course planning session on May 5, 2016, is required. This planning session will cover what items to bring, menu, and other details pertaining to the overnight portion of the course. For questions contact Cheryl McGrenra, Adult Learning Manager, at cherylm@gsccc.org. Do you need to take a Girl Scout Program Basics class? Register through eBiz for the upcoming class! Calling all volunteer support team members! Join us for the Volunteer Support Team Webinar Series! Monday, May 9, 7–8 p.m. – End-of-Year Financial Statements – for all support team volunteers, especially finance coordinators. Monday, May 23, 7–8 p.m. – Assessing Your Volunteer Year – for all support team volunteers. Register here through eBiz. Once you have registered through eBiz, you will receive a link to register for the webinar. It’s time to get ready for another awesome Girl Scout year with renewal. Help keep the party going for those girls who count on us so much. Troops and individual members can take action today and renew their membership. And because we appreciate you, the Council is offering girls, troops and service units some awesome renewal rewards! All girls receive a free Early Bird Renewal patch when renewed by June 6! Check out this incentive flier for full incentive details. Troops, be sure to take time to complete the Opportunity Catalog when you renew. The National Constitution Center is an essential historic Philadelphia destination where visitors of all ages and backgrounds can explore the history and relevance of the Constitution, celebrate their freedoms, and embrace their role in the story of "We the People." The National Constitution Center serves as a hands-on multimedia museum, national town hall and a civic education headquarters. Do you want to learn more about health and the professionals that help us get and stay healthy? Join us for this hands-on learning event at Eastern Virginia Medical School (EVMS). Girls will tour the facility and learn what it takes to attend medical school. Do you need to take a Girl Scout Program Basics class? Register here through eBiz for one of the upcoming classes. Build a Memory, Buy a Brick! Girl Scouts of the Colonial Coast invites you to purchase a commemorative brick to recognize someone special in your life or in memory of a loved one. It is a memory that will last forever and will literally be “etched in stone.” The bricks will be placed around the Girl Scout stone trefoil located at the ceremonial flag pole at A Place for Girls in celebration of the 20th Anniversary of the building. For more information, visit http://www.gsccc.org/media/124278/flyer_buy-brick_events.pdf. Join us for the 33rd Annual Pungo Strawberry Festival Parade. GSCCC will have a group walking in the parade, so plan to join us and then visit the festival for some yummy Strawberry Festival fun after the parade! Contact your Service Unit Parade Chair or Event Coordinator with your troop's RSVP (number of girls and adults) no later than May 1, 2016. Join us for a day of race fun! Girls will race by age group divisions: Girl Scout Daisies, Brownies, Juniors, Cadettes, Seniors and Ambassadors. There will also be two open classes: one for Girl Scouts and one for anyone else (moms, dads, siblings, etc). Trophies will be awarded in each class for first, second and third place and for best design. Contact Laurie Surface at sunfirefish@gmail.com to register. Girls will dive in to coastal science with a day of STEAM (Science, Technology, Engineering, Arts and Math) activities on North Carolina’s Outer Banks. They will learn and interact with local women scientists who are solving global problems facing the world’s coastlines right here in our own backyard. Consider volunteering at Earth Day and choose the time frame that works for you - one hour, two hours or more - and then enjoy the rest of the Earth Day festivities. Girl Scouts will be doing earth friendly crafts and we need you to help instruct others. Contact jennifer.espinosa269@gmail.com to volunteer. Each year, GSCCC recognizes Girl Scout alumnae who are making a difference in their communities in a big way. An awards luncheon is held to honor these women in October. Do you know a deserving Girl Scout alumna? Nominations are now being accepted. You can find the nomination form and more details on our website.